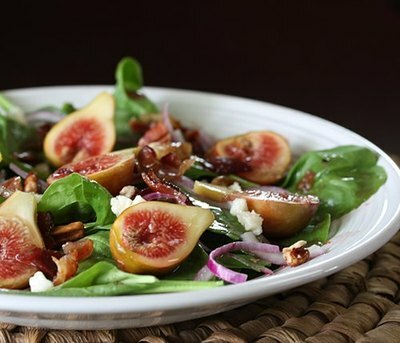 Fresh figs and blue cheese are among the ingredients in this elegant spinach salad with warm bacon dressing. This is a great salad for a dinner party or special occasion meal. Arrange the spinach leaves on four salad plates. Slice figs in half and arrange on the spinach. Sprinkle thinly sliced red onion over the spinach, then sprinkle with the cheese and pecans. Combine dressing ingredients in a saucepan and bring to a simmer. Remove from heat and let cool slightly. Spoon some of the warm dressing over the salads, making sure each salad gets some of the bacon pieces.